J.T. 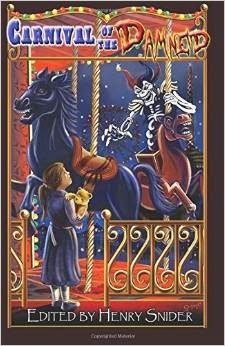 Evans’, Children of the Carnival, is an adult horror short story included in Carnival of the Damned (ISBN: 978-0692247815, 236 pages), that was released in paperback and e-book on 8-25-2014 by Evil Jester Press. The book is available on Amazon. Fifteen tales of dark attractions just waiting for the next wary soul to offer the price of admission. SHOOT the Freak - win a prize! HAVE your caricature drawn? The price is right! GAZE upon the wonders our Oddities tent conceals! TRY the Ferris Wheel - it's the ride of a lifetime! WATCH the big top's center ring fill with beasts beyond imagination SEE a reflection of your darkest desires! LIVE in a world where maniacal clowns rule the night! These are just some of the nightmares this carnival has to offer. About the Author: J.T. Evans is a writer of fantasy, science fiction, and horror. He has been actively been writing since he discovered a local writers group in 2006. He joined the Pikes Peak Writers in late 2008 and attended his first conference in 2010. In that time he has worked his way up the ranks in Pikes Peak Writers from "chair mover" and "auction guard" to webmaster and president of the organization. Until he strikes publishing gold, he pays the bills with software engineering duties.